Backpacking Zanzibar. Nungwi, good swimming and many tourists.. If you want a beach where you can swim anytime in Zanzibar, this is the place! Nungwi area is quite spread out, covering a few km of coast. It´s the northern point of Zanzibar, 60 km north of Stone Town. Tourist businesses are mostly at the seaside, west coast (no reef, that´s why swimming is OK), spread out on more than 3 km. So it´s better you have on idea of where you are going to stay when looking for room. Nungwi is a mix of sandy beaches and rocky coast. Only at low tide you can walk all the way long around the coast. Note: we didn´t find so many sticky “beachboys” in Nungwi, just a few, less at low tide. No big parties, at least end of February, bars and hotels were quite calm, even if many tourists around. We even saw cows on the beach! Dala-dalas: Stone Town- Nungwi, 2.000 Sh, 1h30 (the road has a long part under works, gravel, otherwise tarred road). Nungwi is a final destination, the dala-dalas stop at the end of the asphalt road, in the village center. The beach is around 10 minutes walk, take left if going to southern shore or straight if going north. Many taxis around Nungwi. Quite expensive, bargain. Many big resorts and holiday clubs, specially southern part of Nungwi (south of Z Hotel) and Kendwa, and east of the lighthouse (rocky coast). Expensive. If staying near the beaches, in the guide-books hotels (Safina, Union, Jambo), hard to find a double room for less than 35-40 $. Try to negotiate. Even in the places just behind the beach. Most of these smaller “budget” bungalows are north of Z Hotel, west coast of Nungwi. 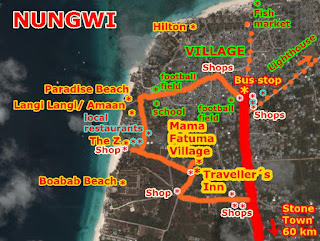 To find real cheap places, not far from the best beaches to swim, go to the “south-west back neighbourhood” of Nungwi (we called it the "red neighborhood" as a few drinking clubs around too, the area is safe, OK). Take the gravel road, going from Z Hotel beach to the main tarred road, there are local businesses with pubs. Some of them have rooms, local prices in Shillings and not $! Traveller´s Inn: where we stayed for 10 days! Price: 20.000 Sh (10 €!) for a double room with bathroom. No negotiation needed, direct cheap price! Correct, big and very clean room. Big garden-yard. Local place with music at night, but quite calm the rest of the day and really safe. Nice staff, little english! Not many tourists around, easy to find a room. The location is between the main tarred road and Z Hotel, southern part of Nungwi. 5 min straight walking to the beach where the Spanish Dancers Divers are. They also have a small local restaurant and shop. Mama Fatuma Village: just next door to Traveller´s. 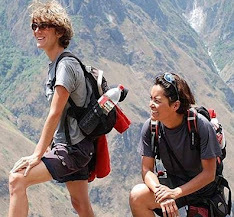 Also affordable accommodation, focused in foreigners, popular with Africa volunteers on holidays in Zanzibar. Prices: you can camp for 5 $/pp (even if forbidden in Zanzibar... they will let you) or get a room for 10$/pp or 15$/pp breakfast included (1 $ is 1.700 Sh in this place, Feb/2015). Kitchen and free wifi. Big commun area. And free bicycle. Good place. Another camp, not far away (just ask in Mama Fatuma), no name, the owner is called Magologolo, with similar prices. 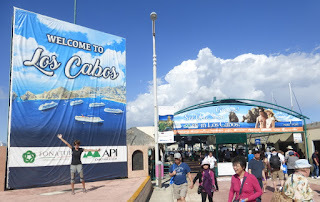 Tourist restaurants on the beach are expensive, prices are in US$ in most of the places! As there´s a village in Nungwi, spread out behind the seaside, and many local people and tourism workers, no problem to find cheap local food. You will find plenty of small shops selling fruits, vegetables and basic things. More around the main tarred road and village center. There´s even a small tourist shop on the beach (near Z Hotel), where cold beer is 3.000 Sh (50cl). A few “mammas” restaurants (Mamma Africa, Mamma Grande…), not far from the beaches, small local places, with a Tanzanian "mamma" offering basic menu (rice, beans, curry, fish, meat) and dishes around 2.000 - 3.000 Sh and small breads. A few “chips&chicken” stalls. More offer near the village center and main tarred road. No ATM´s, only in Stone Town (60 km away). Bring enough cash. Some money changers in the village (dala-dala stop) and around hotels. Many hotels and restaurants on the beach have free wifi. Walk to Kendwa, is just south of Nungwi, follow the beach at low tide. There´s a big long dune (no rocks) with big resorts and then fishermen spots in the lagoon.Swimming conditions similar that in south Nungwi. Enjoy the sunset on the beach: nice moment. Observe fishermen´s life: just south of the lighthouse (northern point of Zanzibar) it´s the fishermen port, many dhows, fish market, boat constructors. Masais, beachboys, football matches, cows, tourists, tourits with masais, souvenirs, etc. on Nungwi beaches: Relax and look! Snorkelling : Prices are around 18-20 $/pp for the day trip and 10 $/pp for the sunset. Many boats (dhows), packed with tourists (often more than 20!). All the snorkelling tours go to Mnemba island (east coast), from 9:30 til around 16:00 (lunch on Muyuni Beach, a beach north of Matemwe), and can include the sunset too. Try to negotiate. We didn´t go. Diving : expect to pay around 140 $/2 dives, usually around Mnemba island, maybe cheaper from Matemwe beach. Sea activities: jet sky, paraglading, around 100 $, in the big resorts in Kendwa. Thank you for this info! 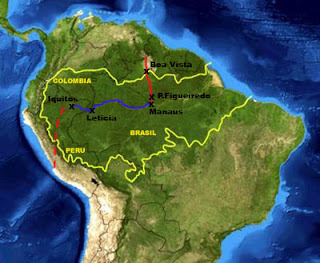 Heading there in the next few days and have noted everything.